Lyn grew up in Melbourne and has always shown enthusiasm for painting and drawing. Her tertiary education at the State College of Victoria and Monash University included major studies in Painting and Art Education. She has participated in workshops by renowned artists, as well as studying the work of painters such as Ray Harris-Ching, William Cooper and Peter Trussler. She draws from the rich heritage of wildlife art in Australia beginning with the natural history illustrations of John William Lewin and John and Elizabeth Gould. After moving to country Victoria, Lyn held the positions of specialist art teacher art in government schools for several years as well as teaching painting in the Adult Education sector. She has painted professionally for over 25 years and been the recipient of numerous art awards and commendations, but much of her work is commissioned by art collectors and nature lovers. Her focus is primarily on sharing the beauty of wildlife, influencing viewers to become more aware, appreciative and respectful of the natural world and the need to conserve it. A keen interest in flora and fauna, particularly Australian birds, is the inspiration behind Lyn’s work. Her aim is to accurately depict the natural environment and this is reflected in her highly detailed paintings. Nature offers limitless subject matter and the bushland setting of her home provides much of that. Additional stimulus comes from regular trips to other parts of Australia, generally for several months at a time. Encounters allowing close observation of animals and birds in their native habitats provide knowledge of their behaviour, interactions and characteristics. The resulting works of art capture the essence and vitality of the subjects, not merely their physical appearance. The meticulous studies are usually executed in a mixture of watercolour and gouache after many preliminary sketches. Detail is gradually built up using very fine brushwork. Many layers may be required to achieve the desired result. 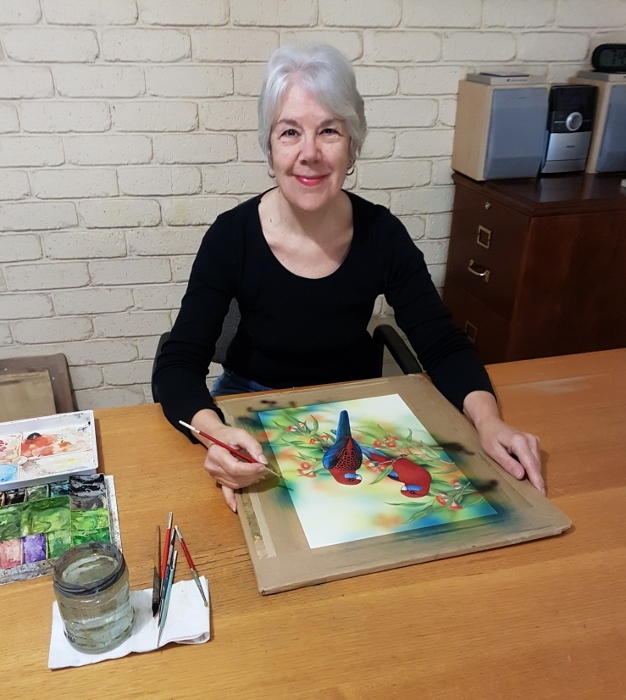 Lyn has had many successful exhibitions, been a guest artist at various shows and her work has featured on television and in articles in newspapers and journals, including Australian Artist magazine. Paintings have also been reproduced on a popular range of greeting cards, bookmarks, calendars and as limited edition prints.